Since January, KMAC Educators have reached 887 students through twelve different artist residencies where KMAC educators go into the schools to lead arts programming. Each year KMAC education programs inspire 30,000 students through memorable art making experiences when they otherwise might have had none. “The residency was for the 75 second graders who were to design African clay masks relating to their current studies. I was assisting in the final step, which was glazing the masks. The children in the first group filed in from lunch and took their seats excitedly. They were extremely polite and respectful and were eager to show me their creations. 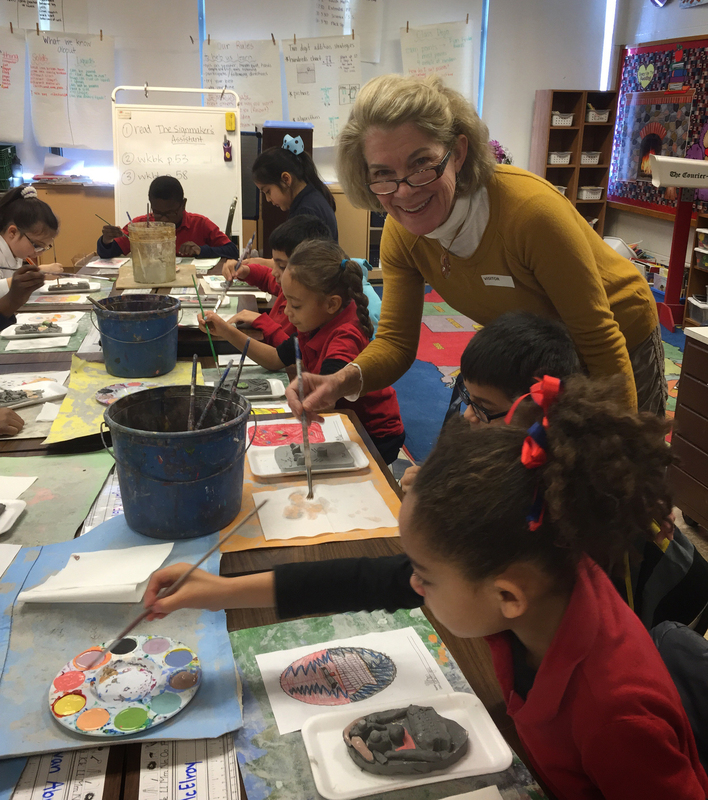 Liz Richter, our amazing art educator, calmly went to the SMART Board and demonstrated how to glaze their pieces. Choosing colors, holding the brush properly, layering glaze, and mixing colors in the palette were among the vastly important concepts conveyed in the few minutes allotted for instruction. Then we were off! We passed out brushes, water buckets, paper towels and glaze palettes. We answered questions and steadied brushes while admiring the wonderful nose on one mask, the incredible hair on another, and the craftsmanship and careful brushstrokes on yet another. Then, of course, the hour was up too soon. The children reluctantly put down their brushes, and we put the masks on the shelves to dry. Brushes were quickly washed and glaze palettes refilled as we moved to the next room of 25 excited second graders to repeat the process. And so it went until the third class was finished. We then carefully bagged all 75 masks and packed them up to take to KMAC for firing.